In Greek, the words for monument (mnimeio) and tomb (mnima) both come from the word “mnimi,” or memory, making cemeteries places where death, life and continuity are celebrated. 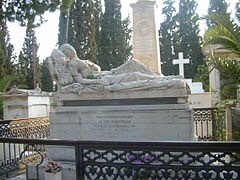 And while other countries make sure to maintain their biggest cemeteries in a state of perfection and to develop them for tourism – like the Pere Lachaise in Paris, for example – in Greece, the country’s most important cemetery, Athens First Cemetery, has for years been neglected by authorities. While there are numerous coffee-table and other such books on the cemetery, there has never been a comprehensive a guide for people interested in its outdoor sculpture and the eminent men and women of politics, the sciences, the arts and the letters who are buried there. 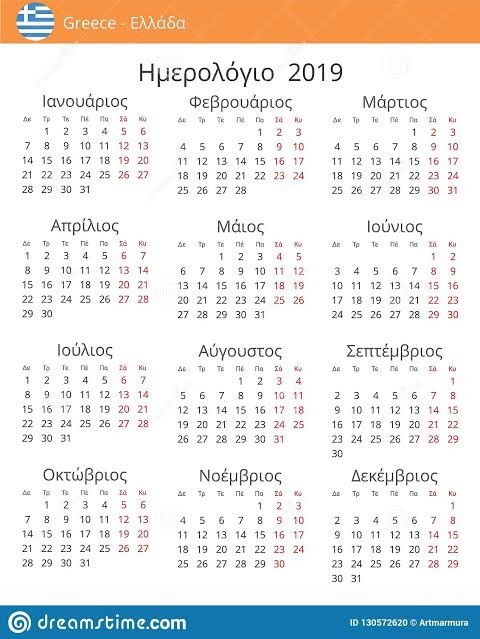 This, however, is no longer the case, thanks to Olkos publications, which recently released an up-to-date and user-friendly guide of 170 pages, comprising texts by Athens University Professor Emeritus Kardamitsis-Adami Maro and architect Maria Daniil, and photographs by the architect and photographer Yiorgis Yerolymbos. The guide is an initiative of the Hellenic Society for the Protection of the Environment and Cultural Heritage, which has done some amazing work in nature conservation and in the restoration of important historic buildings. But what is so interesting about this guide to the First Cemetery? First and foremost, the maps that show the number of each grave site and help visitors locate those that are most valuable from an artistic or historical point of view – anyone who has been there knows how hectic the layout is. 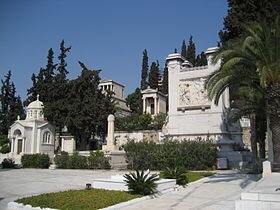 Athens First Cemetery was established by royal decree in 1837 and has been in continuous operation for the entire 180 years since. It was expanded in the 1940s to include a section for Protestants and Jews, while there are also many Catholics in the Protestant section. The Olkos guide provides valuable information on its history, but also extensive references and explanatory texts on the art of great sculptors or craftsmen that adorns many of the burial site. 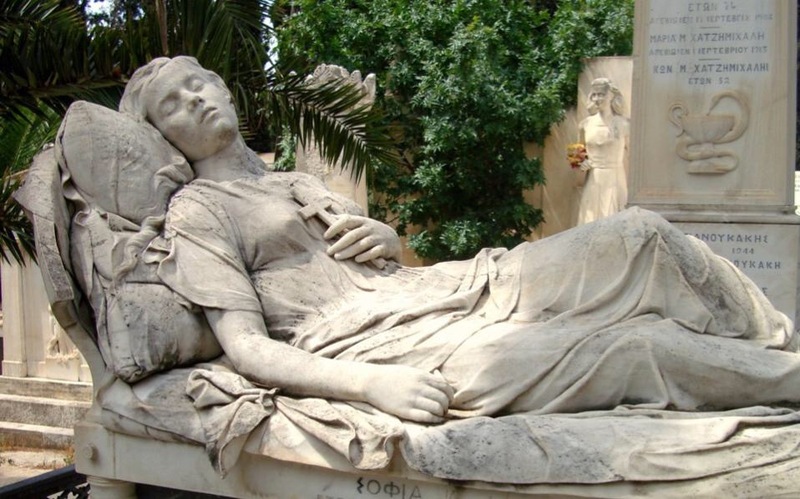 Apart from the emblematic “Sleeping Girl” by Yiannoulis Halepas (which will likely be removed for preservation to the National Sculpture Gallery), there are 1,000 other remarkable sculptures, temples, tombstones and monuments created by celebrated Greek artists of the past and present. There are also works by acclaimed architects such as Lysandros Kaftantzoglou, Ernst Ziller, Theophil Hansen and Aris Konstantinidis. Foreground: Tomb of the Pesmazoglou family (right) and Melina Mercouri (middle). Background: Tomb of Heinrich Schliemann (left on the high pedestal). 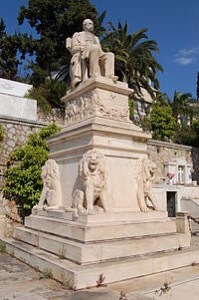 Tomb of Sofia Afentaki, a work of Yannoulis Chalepas. In the cemetery there are three churches. The main is the Church of Saint Theodores and there is also a smaller of Saint Lazarus. The third church is a Catholic church. The cemetery includes the tomb of Heinrich Schliemann, designed by Ernst Ziller, the tomb of Ioannis Pesmazoglou, that of Georgios Averoff, and one named I Koimomeni (the Sleeping Girl), by the sculptor Yannoulis Chalepas, from the island Tinos. There are also separate burial places for Protestants and Jews.